I went into this film with some high expectations, but was still skeptical enough to not see it during its initial theatrical run, and instead saw it at Toronto’s Bloor Cinema. What I didn’t expect was to see such perfection. I haven’t laughed so hard at a film in a long time, especially not in a theatre. One joke that literally had me in stitches was such an obvious joke and was even in the trailer, “What colour is Michael Jackson?” but the execution was done so perfectly that it led to such hilarity. For those who don’t remember, the 1980s was the worst decade in all human history. One of the only good things to come from that decade is me. The fashion was a crime on humanity, and it’s exhibited so well in this film, the music included Poison, and nothing more should be said about that. There is, however, one other thing that came from the 1980s which we all can agree is a masterpiece1 is the 1985 feature film Back To The Future. Back To The Future is a film about Marty McFly, a teenager in the 1980s, who’s older mad scientist friend, Doc Brown, builds a time machine. McFly takes the time machine for a spin, and ends up in 1955, where he accidentally prevents his parents from meeting, and his teenage mother then falls in love with him. Before McFly fades into the abyss of time, he must repair the damage he’s done, and return to 1985. 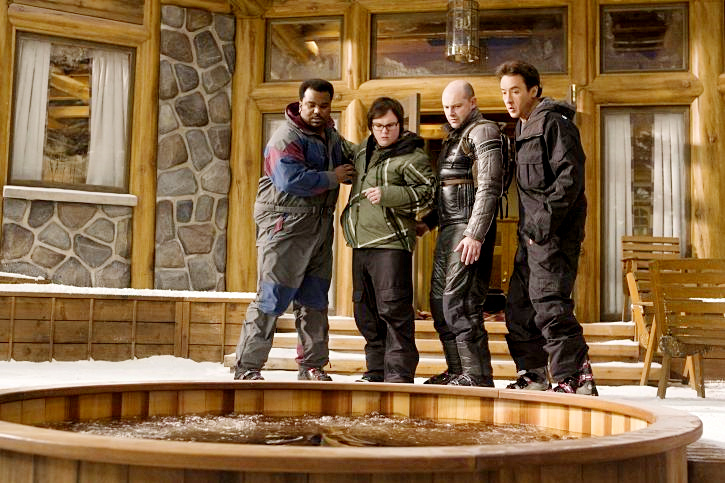 Hot Tub Time Machine plays homage to this film and sends it up in ways otherwise unimaginable. Three of the characters take over their lives at the time, while the fourth, who has yet to be born, is fading in and out of time. Crispin Glover (George McFly) plays a rather large role in the film, too.